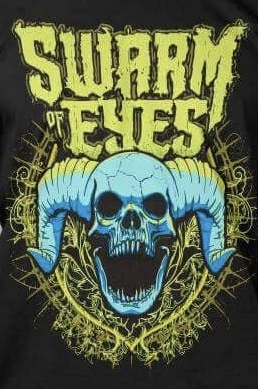 You get two tickets to the gun show with this super-soft premium men's tank, featuring the Swarm of Eyes logo above a mean, green (and blue) horned skull. Blast those biceps and show off your hard earned gains (from either the gym or Shake Shack... we don't discriminate) while endorsing your favorite metal band. This striking image comes to you by way of DarkicoN Designs, the graphic design brainchild of Mike D. of Killswitch Engage.